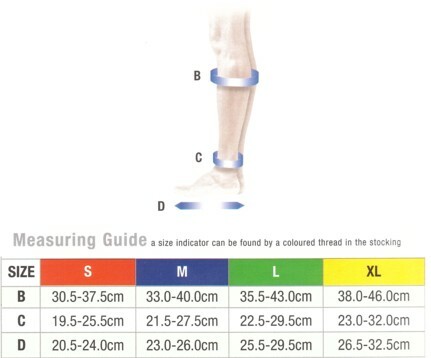 Compression Socks Sizing & Measurement Guidelines - In order to work effectively graduated compression hosiery must be the correct size and apply the right amount of pressure to the leg. It is essential that accurate measurements are taken, you can view the sizing instructions in the size chart image in the product photos. High quality low price Activa below knee compression socks - the knock out blow - A cheap price for superior quality in fabrics and top level manufacturing not only used by the NHS but recommend by medical health professionals across the UK. Who wouldn't give them a try? Activa below knee compression socks assisting you with fight against venous conditions - Alleviating the most common visual and physical symptoms of venous related problems. Washing & Care - Hand wash or machine wash your compression socks on a delicate cycle in warm water with a mild detergent. Do not tumble dry, simply lay the hosiery flat to dry.